One of the best part about travelling by train in Japan is trying its variety of ekiben – lunchboxes specially packed for commuters. 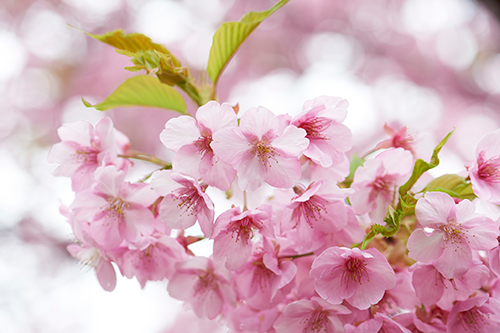 These convenient parcels of food have been around since the birth of train travel in Japan, providing travellers with not just sustenance but also a taste of local specialties wherever they travelled. 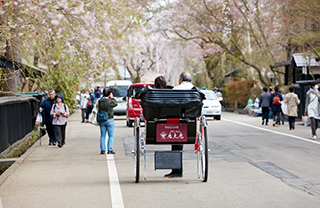 Today, ekiben are an essential part of a Japanese travel experience – so much so that new editions are created to commemorate new train lines, special occasions, or famous characters. 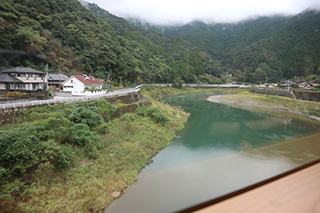 You can buy ekiben at shinkansen stations, as well as on board the trains. The price of an ekiben ranges from under 1,000 yen to 2,000 yen depending on the ingredients. 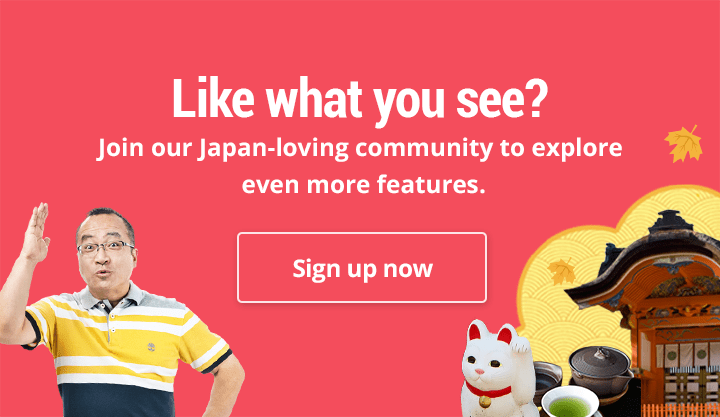 Some of these ekiben are so popular that they sell out within minutes! Just because they’re meant to be ‘fast food’, it doesn’t mean that care and attention aren’t paid to their ingredients or packaging. You can find ekiben featuring quality ingredients like Matsusaka beef, snow crab, and mountain vegetables. 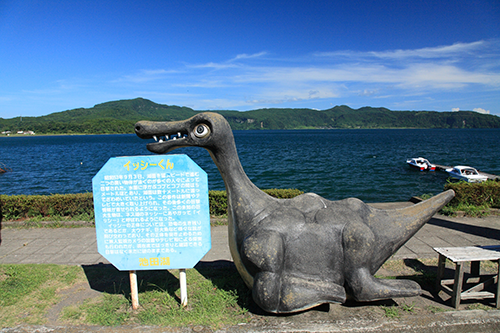 Some ekiben are famous for their beautiful packaging – ranging from terracotta pots to wooden containers – that you can take home as souvenirs. 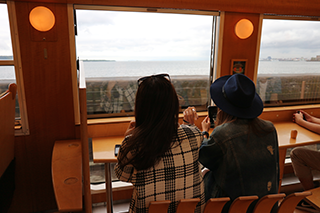 There is something magical about eating a delicious meal while admiring the landscape outside your window – no matter which major train line you take, savouring a box of ekiben is a quintessential cultural experience not to be missed. 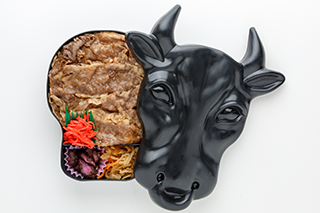 With a packaging that resembles a black cow’s head, Moo Taro Bento contains gyudon (rice topped with slices of cooked wagyu) using local Matsusaka beef, one of Japan’s top three beef brands. 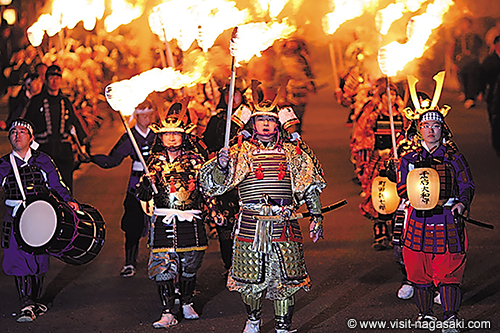 The cattle are given beer to drink and massaged with shochu (distilled spirit) to produce a unique, tender meat. Once you open the bento lid, it plays a tune called ‘Furusato’, a Japanese nursery song (the tune will play 20,000 times when the sensors react to light). Moo Taro Bento (1,350 yen) is available at Aratake, which has a branch at Matsusaka Station. 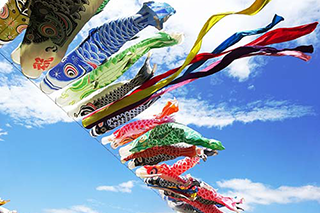 Masu no Sushi is said to have originated in 1717 when Shinpachi Yoshimura, a Toyama feudal lord, gifted the Yoshimune Tokugawa shogunate a sushi made of Jinzu River trout and rice as a formal tribute. 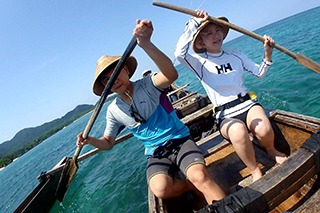 The sushi is made by pressing a layer of preserved trout over a bed of vinegared rice, wrapped in bamboo leaves and prepared in a mini hangiri (a circular wooden container for preparing sushi rice) sealed with a lid. The ekiben comes with a knife so you can cut the sushi into bite-sized portions. 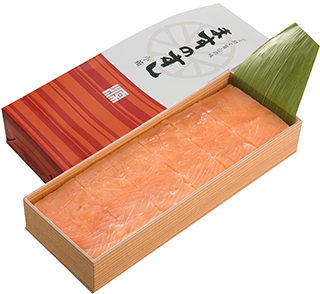 You can purchase Masu no Sushi (1,400 yen) from Minamoto at JR Toyama Station. 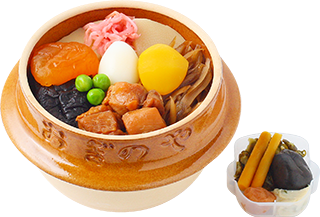 Toge no Kamameshi is an ekiben that contains (Kamameshi - a popular Japanese dish of) cooked seasoned rice in a ceramic pot with chicken, egg, and vegetables like burdock, bamboo and shiitake mushrooms. Toge no Kamameshi is the first ekiben that used kama (Mashiko yaki from Tochigi) was sold in 1958, served in a ceramic pot to keep its warm longer. 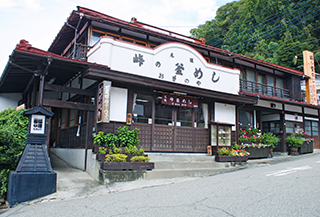 It is reusable that can be cooked original kamameshi or 1 gou rice (a cup measuring about 150 grams).The most famous place to buy Toge no Kamameshi is from Oginoya at Yokokawa station. 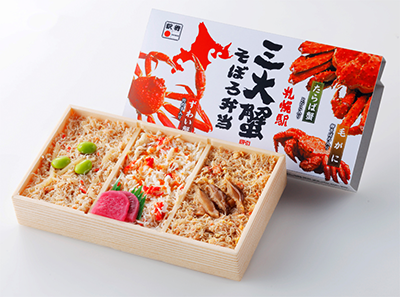 The Sandai Kani Aji Kurabe bento is a representative of seafood from Hokkaido, containing three kinds of crabs: taraba (red king crab), zuwaigani (snow crab), and kegani (horsehair crab). 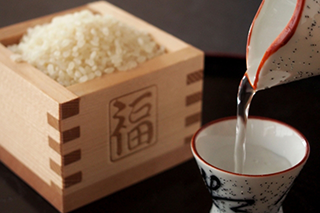 The rice is prepared with kombu dashi (kelp broth), and the bento is separated into three sections, each topped with a generous portion of minced crab and a crab leg of each type. Winter is the best time to enjoy all three kinds of crabs at their freshest. 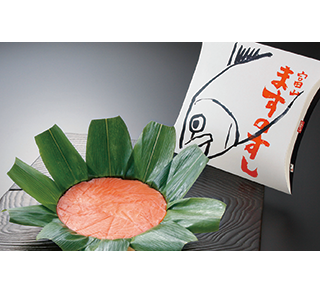 The Sandai Kani Aji Kurabe Bento (1,250 yen) is available year-round, from Bensaitei at Sapporo Station. 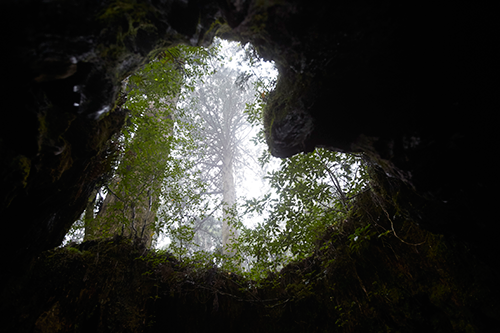 One of Japan’s top brands of beef, Maesawa wagyu is produced in Iwate Prefecture. The beef is known for its fine strips of marbled fat that creates a creamy, tender texture. 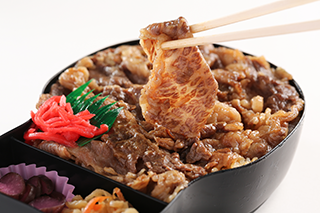 This ekiben contains wagyu nigiri – strips of seared Maesawa wagyu wrapped around pressed rice. While this type of sushi is not common, it’s a great way to experience the meat’s unique flavour and texture, since only the highest grade of wagyu is used. Each box has to be pre-ordered at least two days in advance via Saito Shogetsudo, and available for pickup at JR Tohoku Station. 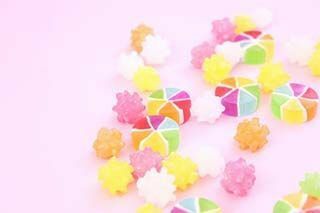 If you’re hopping on the newly-launched Hello Kitty Shinkansen – from Hakata Station in Fukuoka and Shin-Osaka Station in Osaka – then why not sample its namesake ekiben as well? 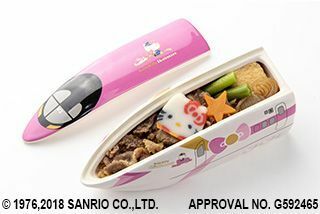 This ceramic version of the pink bullet train contains Kobe-style sukiyaki – local slices of beef served with a Hello Kitty-shaped fishcake, fried tofu, boiled konnyaku jelly, and star-shaped carrots. 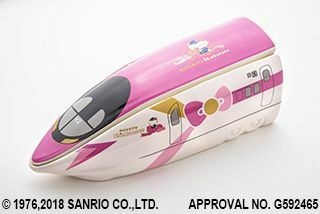 The Hello Kitty Shinkansen ekiben (1,500 yen) is available from Awajiyaat Shin-Kobe Station and Kobe Station.